About the Children's Department: Look at What People Are Saying About Deeper In 4 Grandparents & Parents, Too! Praying the Scriptures for the Children You Love! Look at What People Are Saying About Deeper In 4 Grandparents & Parents, Too! 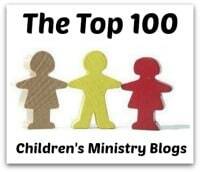 Praying the Scriptures for the Children You Love! The other day I was very happy to share with you about my books - Deeper In 4 Grandparents & Parents, Too! 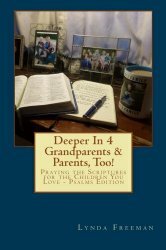 Praying the Scriptures for the Children You Love - Psalms Edition and Deeper In 4 Grandparents & Parents, Too! Praying the Scriptures for the Children You Love - Old Testament Edition and how they can help grandparents and parents pray intentionally and regularly for themselves and the children they love. I also shared one complete week with you, so you may give it a try! I do believe they are books which will prove to be very useful tools for grandparents and parents . . . but, then I did write them, so it is possible my opinion would tend towards the "biased" side! So, today I thought it would be fun to share with you some of the opinions of people who read my books before they were released . . .
"Lynda Freeman has written an invaluable book which every grandparent and parent will benefit from. Deeper In provides an easy-to-grasp method of praying the words of Scripture for the children you love, as it is saturated with God's word, centered on the cross, and sure to help you develop a habit of praying for your child or grandchild. Lynda's simple, yet profound method has the potential to transform your prayer life and the lives of children." “Lynda Freeman is a prayer warrior, firmly grounded in her love for Christ. Coupling her passion for God’s Word with her commitment to prayer, she has constructed this remarkable step-by-step guide for praying the Psalms. The structure of this devotion is simple and user friendly. One passage of Scripture is assigned per week. This allows God’s Word to marinate as He reveals His message to the reader. The questions and prayer which accompany each passage are insightful; at times challenging. “I'm a grandmother of four beautiful grandchildren from my two daughters. I found Lynda's blog through a Google search one day not long after I became a new grandmother. I've followed her since and have been richly blessed by her love for the Word of the Lord and her own grandchildren. She has taught me so many wonderful ways to pass on my Faith to my own grandchildren. “After reading Deeper in 4 Grandparents & Parents, Too! Praying the Scriptures for the Children You Love – Old Testament Edition, my commitment to pray for my grandson has deepened. It is so important in today's busy and hectic world, in which our grandchildren are growing up, we, as Christian grandparents, pray not only for our grandchildren, but for our grown children as well. I grew up without Grandparents and know the void I felt when others around me talked about their relationships with their grandparents. I longed for this as a child. So, now I have the opportunity to invest in my grandson's life, and am taking full advantage of it! Having a well written Bible study/prayer book to refer to will give me an awesome opportunity to connect with our Loving and Wonderful Father in Heaven as I commit to an ongoing, structured prayer life for my grandson, my sons and for myself as well. I have known Lynda Freeman for over 30 years, as she is my wonderful sister-in-law! Our children are very close in age, so we were parenting at the same time, even though distance kept us apart, as we live in California and Lynda and her husband David live in Michigan. We both saw the love of our spouses’ parents for their grandchildren; it is a relationship my sons, now 31 and 29 years of age, consider to be PRICELESS. I now have the opportunity to have this kind of relationship with my grandson. "There is an old Arabic proverb which says, 'If you don't have a grandparent in the house, go buy one.' Whether grandchildren live close by or far away, grandparents have a sacred trust to become prayer warriors for them. Lynda Freeman's book, rooted in Scripture, provides guidelines to help grandparents carry out their trust. Even grandparents who pray regularly for their grandchildren will discover how to make the practice more meaningful. I loved this book!" Such kind words - I am honored each of these people took the time to read my books and oh, so happy they found them to be helpful and usable tools to aid grandparents and parents as they pass on a heritage of faith to the children they love! Please give them a try to see if they help you become more intentional and focused in how you pray for your life and the lives of those you love!